The word "chamber" is a reference to the part of the gun that holds the bullet before it's fired. The ad has appeared in recent editions of Sports Illustrated and ESPN the Magazine. We seemed to be left with a choice: either Nike has truly inappropriate and accidental timing, or the advertisement is an example of Nike subtle, and intentional, marketing scheme. (If I'm leaving an option out, let me know). 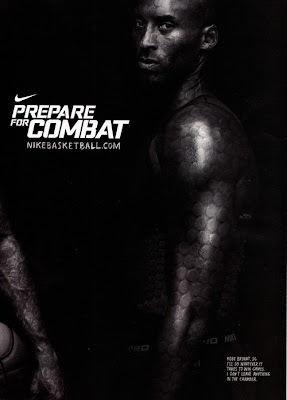 "The Nike print ad featuring Kobe Bryant was intended to illustrate his all out play and commitment on the basketball court. It is a commonly used reference for shooting the basketball and no offense was intended." "[The ad] has nothing, zero, to do with guns. At all. At all. Zero, that's very simple. For somebody to even say that - that's a basketball term. 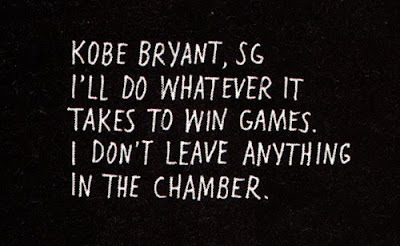 To try to highlight Kobe and say that he was referencing guns is totally ridiculous." "...We say a lot of things as basketball players that make a reference to guns and violence, but it's not really guns and violence." The problem is that it connotes violence. Naming a product "Pro Combat" insinuates combat, as in war. That is, in part, why city officials in Cleveland rejected the LeBron Pro Combat mural in November of last year. At the time, Cleveland commissioner Tony Coyne said "he felt the 'combat' reference is also inappropriate, at a time when U.S. soldiers are fighting in Iraq and Afghanistan." Has that situation changed? Is it now, suddenly in 2010, appropriate to be mixing metaphors without contemplating the ramifications? To use another example, if, according to James, "it's not really guns and violence," then a team nickname like the "Bullets," would be harmless, no? Ownership of the now-Washington franchise changed the name from Bullets to Wizards in 1997, amid concerns of the violent connotation. there's nothing violent about this guy. Either way, I have a hard time believing this was an accident on behalf of Nike. The previous "Pro Combat" advertisements suggest that they are fully comfortable portraying sport as violent war. But regardless of whether it was or not, it's just another example of how violent language is normalized in the world of sport. Which, as your mom always told you, is all well and good until someone gets hurt...or has a gun drawn on them in an NBA locker room.